NEMA Type 12 Operator Workstations - Electrical Cabinets for Industrial Operator Interface to Mount Push Buttons and HMI's, by Saginaw Control. NEMA Type 12 Operator Workstations - Electrical Cabinets for Industrial Operator Interface to Mount Push Buttons and HMI's. Designed for electronic controls and instruments. Equipment can be mounted on the sloping control panel door. Interior components mount to stationary panels. Heavy duty construction provides protection from dirt, oil, dust, and water. White powder coated inside and ANSI-61 recoatable gray finish outside over phosphatized surfaces. 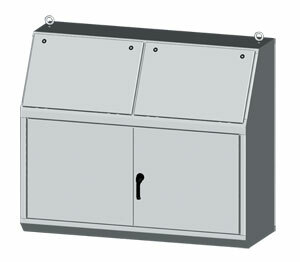 Optional top sections are ANSI-61 recoatable gray finish inside and outside. Optional panels are powder coated white.